Big, Bold, Beautiful Food: Will You Take the Snow Day Food Challenge? 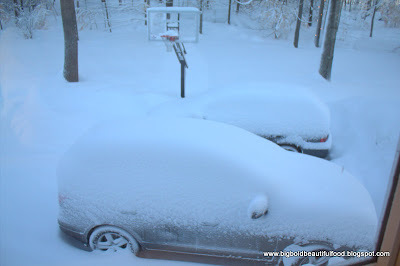 In my neck of the woods, we have been pummeled by snow storms. After a noon release from school yesterday, I asked my friend and co-worker, Julia, if she thought the roads were passable enough to go to the grocery store on the way home from work. Julia said, "Why go to the grocery store? Let's go home, be creative, and cook from what we have available." Thus the Julia Gabriele Snow Day Challenge was born. After spreading the news on Facebook and email, we both started foraging in our kitchens. We sent each other pictures of our work in progress, including Julia sending me a picture of a giant frozen turkey carcass in water looking like it was trying to escape out of the Le Crueset pot. Priceless! She wrote, "It's called 'progressive broth'...I'll simmer it until it fits, pick the meat off, add more parts, do it again.....I'm just not sure what this is going to be yet ..."
As for me, I found all sorts of things to cook too -- frozen meats, tons of pantry items, and some fresh vegetables. I even had an extra 1/2 gallon of milk in the fridge. Why go to the store indeed? 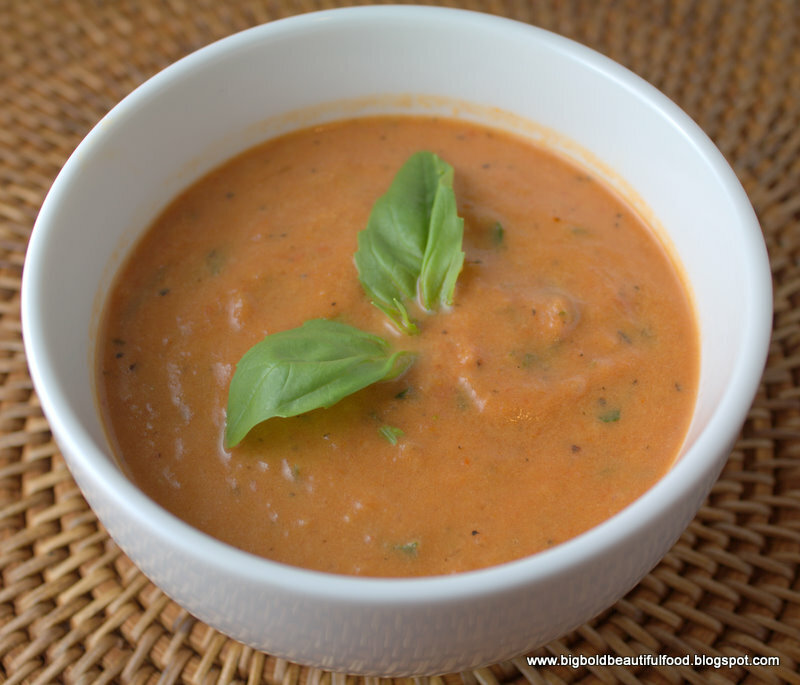 Christine: I find myself in this situation frequently and usually rely on something from the freezer to get me going - I almost always have pork tenderloin and some chicken breasts I can defrost. If that's bare, I'll create some kind of soup with whatever vegetables, small pasta, beans, and leftovers are on hand. If I have time, I make biscuits or popovers to go with it, and everyone thinks I planned all day. Otherwise eggs in some form - souffle, quiche, frittata. Tracey: Fried Rice or Stir Fry. I take whatever veggies are in my fridge, I always have rice and eggs on hand, and then put them together with spices. If I have chicken (or beef), I will add that as well. Big favorite of the kids. Heather: I did not plan ahead for dinner last night and had to use what was in my fridge and pantry. Linguine with zucchini sauteed in olive oil with diced onion, mushrooms and garlic. Parmesan cheese was then added. Jane: When you have the luxury of having a snow day with no children at home the menu can go in a whole different direction. Popcorn, smoked oysters, omelettes, dark chocolate ... wine? Elisabeth: For tonight, Barefoot Contessa spaghetti and meatballs, rocket salad If we're home tomorrow, crab cakes and wedge salad plus some baking- a carrot cake. Our fall back meal is always omelettes which my husband actually makes- it's his "thing." Kate: Tonight I made spinach souffle and angel biscuits. Did you notice that wine seems to be a requisite pantry item? 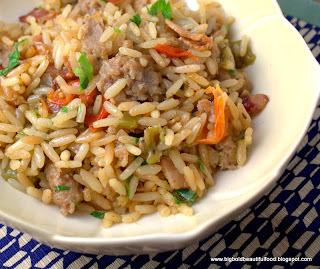 Cajun-style dirty rice with cooked Italian sausage I found in the fridge, Uncle Ben's rice, a green bell pepper, and leftover caramelized onions. 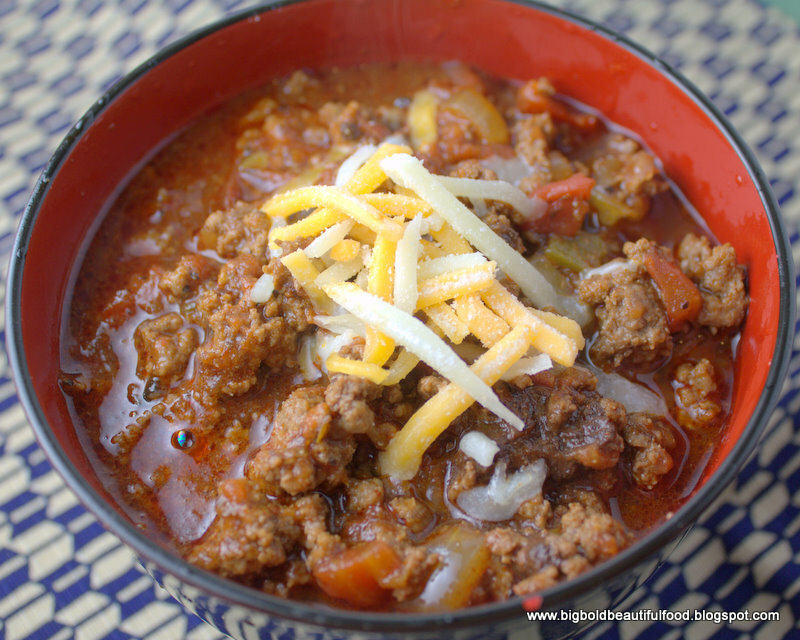 A wonderfully, flavorful dish made even better with lots of hot sauce! This type of dish was a favorite of mine and my husband before we had children and he went carb-free. Here's a recipe of this type of dish that I posted before. 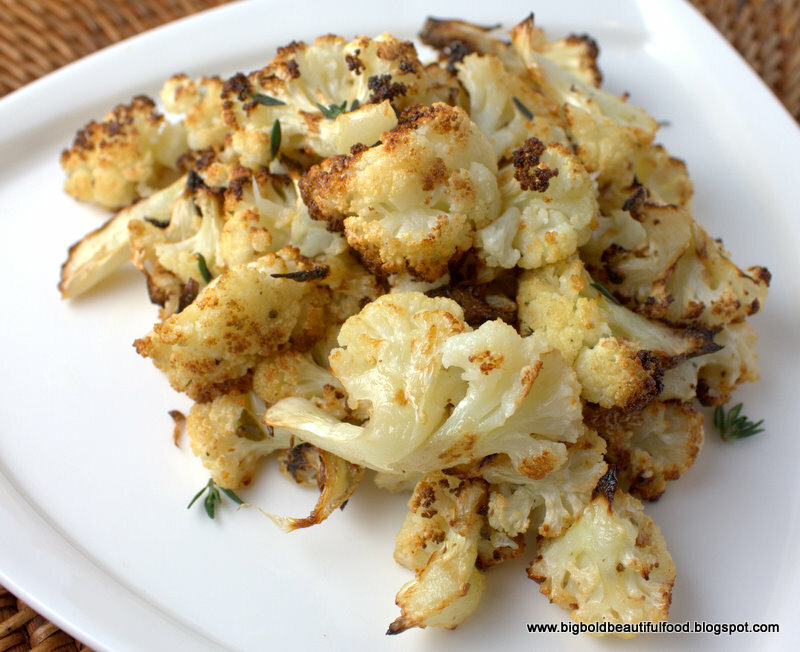 Roasted cauliflower, hands down our most favorite way of preparing this vegetable. Regina, a friend of my daughter and a notoriously picky eater, actually ate these last night and liked them. Apple galette with Granny Smith apples, cinnamon, nutmeg, sugar, and Pillsbury pie dough crust. This was okay, not great. My blueberry galette is much better because of the homemade dough, and I haven't gotten a handle on the apples and the balance of sweetness to tartness, as well as the right size and texture. 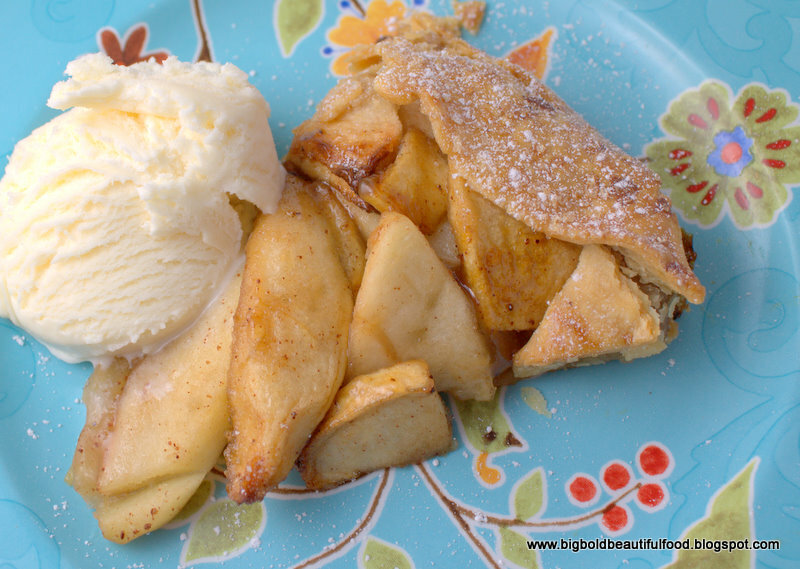 When I make this, the apples always seem to get dried out on the top before they get tender. Any suggestions? 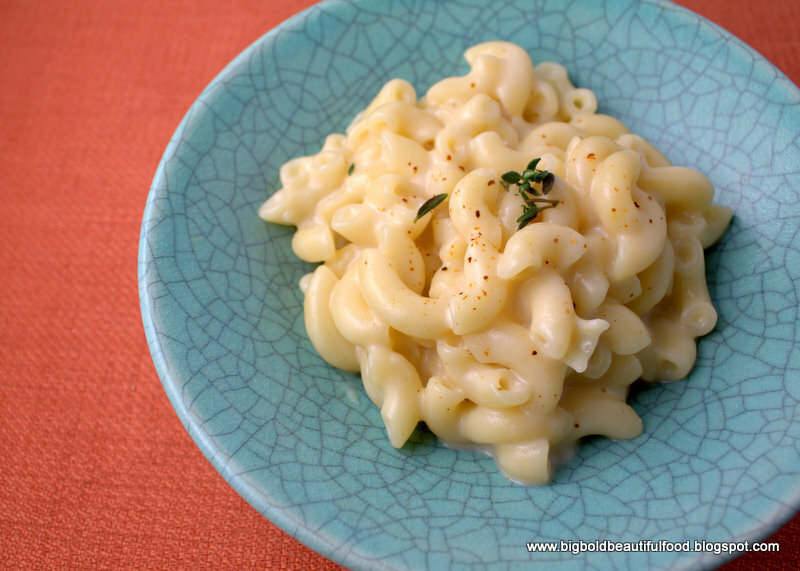 White mac-n-cheese made with gruyere, manchego, and American cheeses with thyme-infused bechamel and a sprinkling of cayenne. Tomato bisque made out of canned fire roasted tomatoes, broth, canned evaporated milk, and fresh basil. 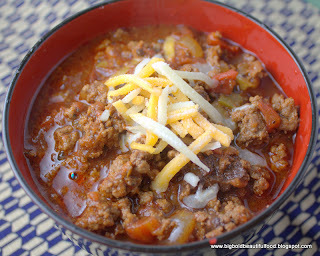 Chili with ground beef, canned fire roasted and Rotel tomatoes, 7 tbs. of spices, beef broth, leftover coffee, beer, and unsweetened chocolate. 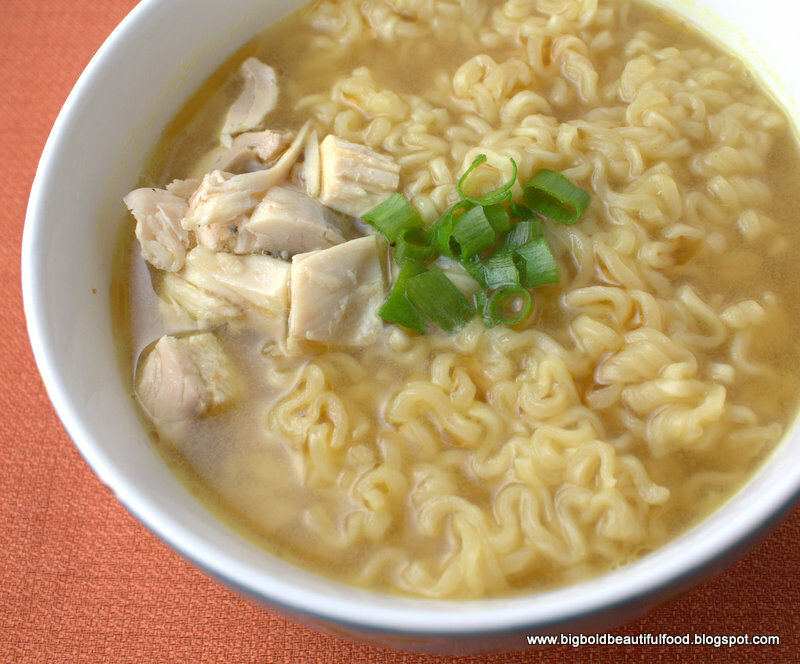 Ramen with quick Asian broth (chicken broth, soy sauce, grated ginger, white pepper, sesame oil) with leftover chicken. 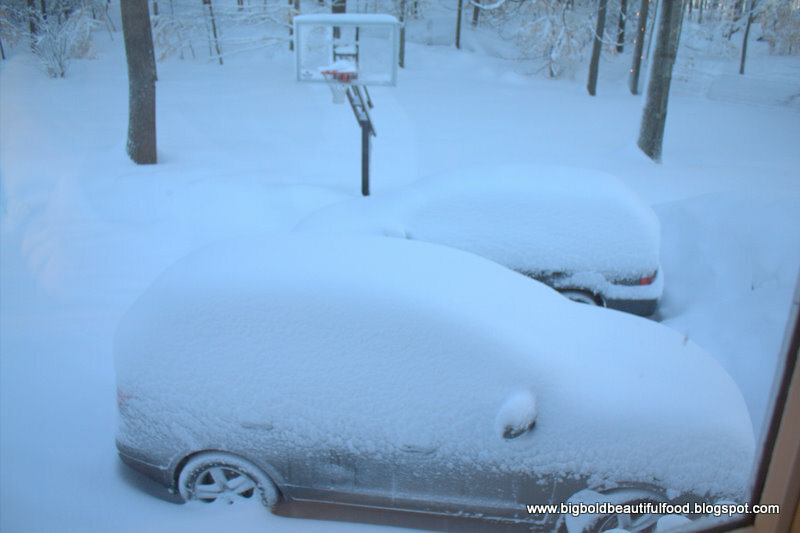 Whether snow is your muse or not, how would you respond to the challenge of cooking from what you have? I like the creativity the snow storm generated! Fun that you shared your adventures on Facebook. I usually hit the wok when I am trying to pull a menu together on the fly. I usually take this approach on the day or so leading up to vacation, when I am trying to cook with what I have and want to use before we leave.